(1) Heat 2 tablespoons of butter in a sauté pan over medium-high heat. When the butter foam recedes, add the chopped onions. Sauté the onions for a few minutes until they just begin to brown. (2) Add the peas and the chicken stock and bring to a rolling boil. Taste for salt and add if needed (you might not need to add salt if your stock is already pretty salty.) If you want, add a pinch of sugar to highlight the sweetness of the already sweet peas. 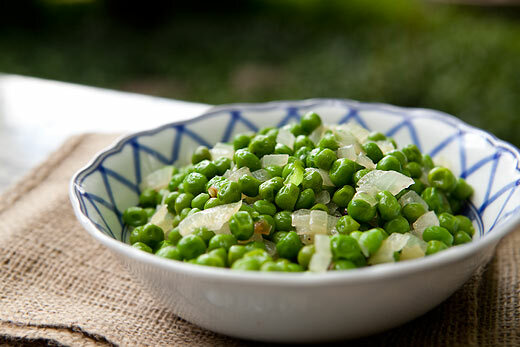 (3) Stir the peas and onions often – you want the stock to reduce by about half without overcooking the peas. When the stock has reduced, turn off the heat and add the remaining butter and some black pepper. Serve at once. If you want, sprinkle on some sliced fresh mint. Chicken Curry in a Hurry!! Are you familiar with Mark Bittman? He writes "The Minimalist", a syndicated recipe column for the New York Times. He tends to strip recipes down to their essentials (hence the "Minimalist") and simplifies complicated recipes for the home cook. 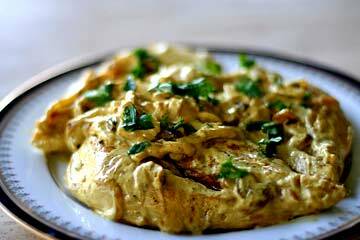 This chicken curry is a great example of a simple Bittman recipe - quick, tasty, filling. *Some chicken breasts are bigger than others. We had two huge breast halves that added up to 1 1/2 pounds. To make them more serving sized, we sliced each half in half, horizontally, to make 4 breast pieces. 1 Put the oil in a large skillet over medium high heat. When hot, add the onions (and optional raisins), sprinkle with some salt and pepper, and cook, stirring occasionally, until translucent, about 5 minutes. Turn the heat down to medium, sprinkle with half of the curry powder, and continue to cook a minute or two. 2 Meanwhile, season the chicken with salt and pepper to taste and sprinkle it with the remaining curry powder. Move the onion to one side of the skillet and add the chicken in one layer. Cook for about 2 minutes on each side. Transfer to a plate. 3 Add the sour cream and stir constantly over medium-low heat until the mixture is nice and thick. Return the chicken to the skillet and cook for a couple more minutes, or until cooked through, turning once. Garnish with cilantro or parsley and serve with rice. Always? or on some special events? Share your experience with everybody! May 5th! Cinco de Mayo! Today is a voluntarily-observed holiday that commemorates the Mexican army's unlikely victory over French forces at the Battle of Puebla on May 5, 1862. For commemorating this glad day, I'd like to introduce a cocktail you can feel Mexican beach, Tequila Sunrise. What a easy cocktail it is! Isn't it? :D This cocktail has really fantastic combination of orange and tequila flavor. In addition to that, it can make your eyes pleasant too. In a festive mood, how about enjoying a tasteful cocktail with your friends? Here is the best assistant to support the festive mood, Tequila Sunrise. We know--you just got home and you're hungry now. You'd never know these delicious recipes only take 15 minutes to prepare. In a large skillet, heat oil over medium high heat until hot. Add fillets and squeeze 1/2 of the lemon's juice over the tops. Sprinkle with pepper to taste. Cook for 4 minutes and turn. Squeeze with the remaining lemon's juice and sprinkle with pepper to taste. Continue to cook until fillets flake easily with a fork. A dinner with housemates and a Guest, Loren! This dinner was supposed to be way smaller than what it actually was. 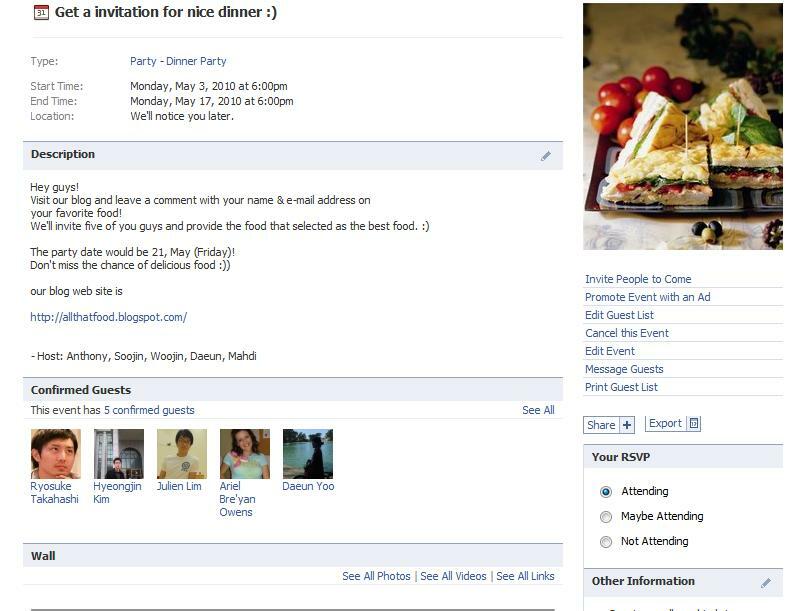 I just invited Loren and thought of having simple ready-made foods like pizza and French fries. However, because of the fact that we had plenty of ingredients such as pork, cabbage, eggs, carrots, curry powder and so on, we put a little bit more effort into preparing this dinner. What we cooked was listed below. Sadly, I forgot to take a picture of this. This is such an easy and simple side dish which goes well with steamed rice. a. 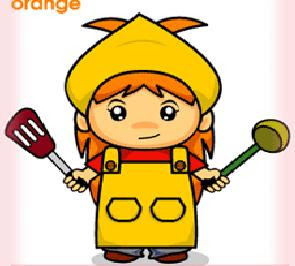 Prepare eggs and vegetables such as carrots and onions. b. Break eggs and stir in a bowl. Try to make the liquid of egg just yellow, but not white. c. Put vegetables chopped into the bowl and stir together. d. Put a little bit oil on a fry pan and wait till the appropriate temperature. e. Pour egg combined with vegetables into the pan and make a thin layer. Can you see the picture of two pots? The white pot is used to boil pork and cabbages. a. Prepare pork, cabbages and a sauce named Ssam Jang which is a typical Korean bbq sauce. b. make slight cuts in the big chunk of pork in order to help the inside chunk to be perfectly cooked. c. boil cabbages first and pork seperately. To enjoy this in proper way, let me give you a tip. it. If the piece of cabbage is big enough to wrap more stuff up, you may put rice on it. b. dip it in the sauce. Japanese curry is different from what you expect from Indian curry. If you like curry but haven’t tried this one yet, I strongly recommend having this. 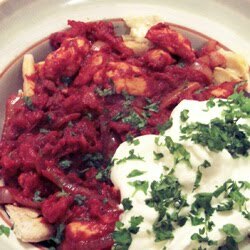 The way of making this is basically same as normal curries. Just go get a Japanese curry powder and make it! How to make curry will be covered in another posting more specifically. We used Korean rice. Korean rice has some attributes which differentiate itself from rice produced in other countries, including India and South Asia. We had an awesome time with the foods and games which we played right after having the meal. Do you want to be invited to our lovely place? 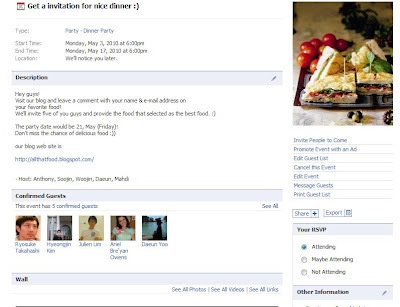 We’re having an event to invite people weekly and will serve nice food. The details of this event will soon be uploaded! It's already May 2nd! Time flies! :D As it's getting hotter these days, sometimes I crave some cool and delicious food. Here is the dessert, Watermelon Hwachae(honeyed juice mixed with fruits as a punch) for cooling even if it's a little early in spring. (actually this food is better in summer, in the heat of the day.) In Korea, many people want this for being away from the heat in summer. The way to make is really easy I bet everyone likes this punch except someone who doesn't like fruits. then..Let's see! 1. Fruits ; Watermelon, Apple, Kiwi, Strawberry, Chinese Pear, Grape and whatever you want! : The main is watermelon though, if you don't like watermelon, it doesn't matter changing the kind. However, you know, the original version is mostly the best. ※ please don't throw the juice of watermelon away after cut or scoop it. it would be used very useful later. In this step, if you add some milk, it would be more unique and delicious. 3. Add all pieces of fruits in the juice bowl.